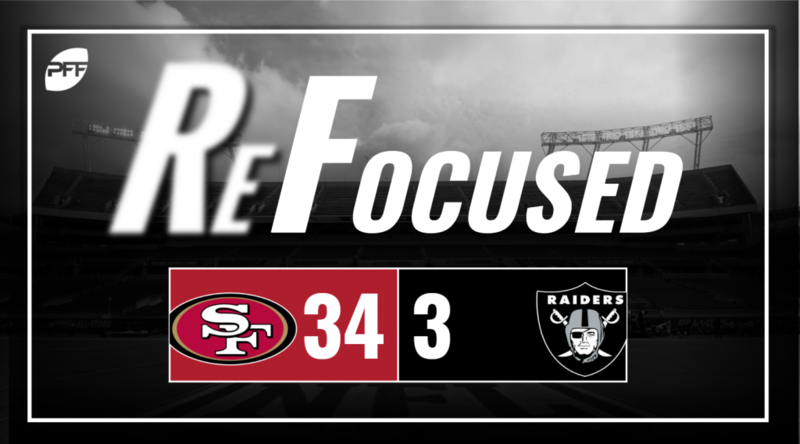 The San Francisco 49ers defeated the Oakland Raiders, 34-3, in Week 9 of the 2018 NFL season. Nick Mullens was given his first career start in place of injured C.J. Beathard, and it went very well. Mullens completed 72 percent of his passes and threw for three touchdowns on the night. and generally kept the ball out of harm’s way. It wasn’t a perfect night, as he did throw a slant on their second drive that should have been intercepted by Daryl Worley in the end zone, but it went right through his hands for a dropped interception. George Kittle entered the game as our third-highest graded tight end, and he had another big night as a receiver. His best play was an amazing one-handed catch on a slant that he turned into a 71 -yard gain with a broken tackle to boot. The 49ers’ pass-rush feasted all night long against a ragtag offensive line. Led by Dekoda Watson (two sacks, multiple pressures) and Cassius Marsh (three sacks, multiple pressures), the San Francisco front seven did what they wanted all game long. Richard Sherman has come down a bit from his otherworldly coverage stats from early in the season, but he’s still locking down his side of the field. He turned in another strong performance against the Raiders on Thursday night. It started out so promising on an opening drive that ended in a field goal, but then everything that could go wrong did. Derek Carr was under constant pressure behind a makeshift offensive line and got sacked six times. When he did have time, Carr seemingly never stretched the field, constantly opting for shorter passes rather than pushing the ball deep. Former All-Pro guard Kelechi Osemele may have turned in one of the worst games of his career. To be fair to him, he was moved out to left tackle midway through the game, and that’s where a lot of his struggles came, as he allowed multiple pressures on the edge. Very little went right for the Raiders on defense. Whether it was losing outside contain on a run, busting a coverage or just taking poor angles after the catch, they just gave up too many big plays that were far easier than they should have been. Typically, getting pressure on an inexperienced quarterback is a pretty good gameplan, but the Raiders were completely unable to affect Mullens. They failed to get a single sack, only knocked him down twice and otherwise did next to nothing to disrupt his rhythm or reads throughout the game. The San Francisco offense featured a balanced attack, picking up almost 150 yards on the ground, while also completing nearly 75% of its passes. The Oakland offense was stagnant all night long and with Carr averaging just 5.7 air yards per target; the 49ers defense was never threatened.